Synopsis: Mike Banning (Butler), the former head Secret Service agent to President Benjamin Asher (Eckhart), has been demoted to working the Treasury Department after Banning saved Asher in a car accident but couldn't save the First Lady. When North Korean terrorists infiltrate the White House and take Asher and part of his Cabinet hostage in order to get U.S. troops pulled out of the Korean DMZ, Banning ends up being the only man who can get inside the building and save the President. Andrew: Hello readers! 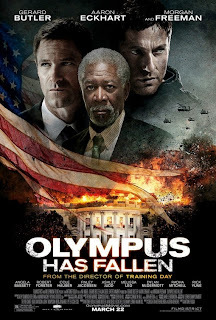 The other night Sarah and I decided to catch a movie that's been out for a few weeks and we hadn't had the chance to see yet, and that movie was Antoine Fuqua's Olympus Has Fallen, starring Gerard Butler (300) and Aaron Eckhart (The Dark Knight). In the film Butler plays former U.S. Army Ranger and Secret Service agent Mike Banning, who - after the White House is attacked by a North Korean terrorist group - winds up being the only man who can stop the terrorists from their fiendish plot. Honestly this was a film that we were terribly interested in seeing but we needed to see something and this seemed like one of the better options out of everything in theatres we haven't already seen. Sarah, what did you think of Olympus Has Fallen now that we've seen it? Sarah: It was not what I expected at all! It's extremely violent, and honestly I went in expecting something very lame. My expectations for this film were extremely low and...it pleasantly surprised me! It was action-packed and it was full of very intense and good fight scenes. There was some good character building, and overall it wasn't awful like I was expecting it to be. What did you think? A: I agree with you, I was pleasantly surprised at how action-packed and, the way I kept thinking about it as we were watching it was, "Man, this is a real guy's movie in a good way!" The best way I can sum up this movie to someone is that it's Die Hard at the White House. S: That's a very accurate way to put it. A: It has all of the classic tropes and set-up for how Die Hard went down, all the way down to our protagonist coming across a bad-guy, not knowing that he's a bad-guy and sort of chatting with him as an equal for a bit, right down to them smoking cigarettes, too. I was kind of rocking to that vibe. A: And some very bad CGI all over the place, particularly the fire engulfing the White House at times. S: But it has a great cast! I mean, Butler has his Matthew McConaughey moments, but he plays well with this cast, especially Aaron Eckhart's President Asher. But look at this cast! There's the two of them, there's Morgan Freeman as the Speaker of the House, there's Melissa Leo as the Secretary of Defense, and who else? A: Angela Bassett as the Secret Service Director, Ashley Judd as the President's wife, Dylan McDermott as another former Secret Service agent, Radha Mitchell as Banning's wife, and the guy who played the diamond-faced bad guy in Die Another Day. A: And a pretty good one at that. They all filled their roles admirably. I especially thought Morgan Freeman was the right choice for his role, particularly because at one point he has to say a line that coming out of anyone else's mouth would have just been terrible, but when he says it it just has this sort of gravitas and you go with it. S: Oh I was all set to groan at the line as he starts to say it but he ended up delivering it pretty good. A: I agree with what you said earlier about how it's more violent than I ever expected it to be. S: Oh my God, there were so many times where I was just like "Wooooow, I can't believe they just showed that!" S: There really wasn't a whole lot of bloodshed, did you notice that? I mean there were shots, but for the amount of knife stabbings there really wasn't much blood there. A: But what I liked about it is, while a ton of this movie is ridiculously over-the-top, some of it made a lot of sense to me. Like there's a scene where the bad guys are really starting to enter the White House after they've shot up everybody and they're going through all of the bodies on the ground and putting an extra bullet into their heads just to make sure they're dead. S: I was waiting for him to do that exact thing, too! Because it's such a good cop-out. But they didn't make him do that, he successfully evaded the bad guys and just bad-assed his way through the movie. A: While the dialogue at times was terrible and so much of this movie was unbelievable, there were actually some really good things about this script and story. S: Yeah, he needs to stop doing cheesy rom-com type movies. S: And I thought he and Aaron Eckhart had really good chemistry in this film. They were believable as friends, I felt like. A: Definitely. He just needs to embrace these kinds of roles and films like Dwayne Johnson is starting to. Were there any negatives in Olympus Has Fallen that turned you off? S: I mean...it's currently relevant so I guess that makes sense, but really the North Koreans are the only bad guys we can really portray like this without getting repercussions. But I had a bit of a hard time believing something like this could actually happen. It's pretty unbelievable, but so are a lot of action movies I guess. It's a movie, and the Koreans make good bad guys. It's humorous. A little terrifying to think that it wouldn't take too much to get our country's leaders to crack, but again, just a movie. Other than that I didn't have a problem with it. It was a good action film, it was entertaining, it was cringe-inducing from some of the violence, but overall I liked it! A: There were a lot of small things that this film did well. And I didn't know this until the credits started rolling, but I didn't know it was directed by Antoine Fuqua, who directed Training Day and Shooter, two movies that I thoroughly enjoy. Training Day had a great cast and was a really good cop drama, and Shooter is a really underrated action movie, so when I saw that Fuqua had helmed Olympus Has Fallen a lot of things started to make sense to me. Like the opening sequence, I thought they did a really good job setting up what Banning's relationship with the First Family was, which helped with some emotional payoffs later in the movie. S: ...and I'm glad that we saw this one because in a few months White House Down comes out and I'm looking forward to seeing what the difference will be between the two. It'll be interesting to see two different stories on roughly the same topic. A: It's kind of funny how we sometimes see movies with similar premises come out in the same year, like Armageddon and Deep Impact did. S: True. So it'll be interesting to see which one kind of comes out on top. I think this one might've gotten a bad rap at first because Gerard Butler has a bit of a reputation as not being the best actor or not being in great movies. A: Honestly, this is the Die Hard movie that Live Free of Die Hard should have been. That would have been a great name for this movie.